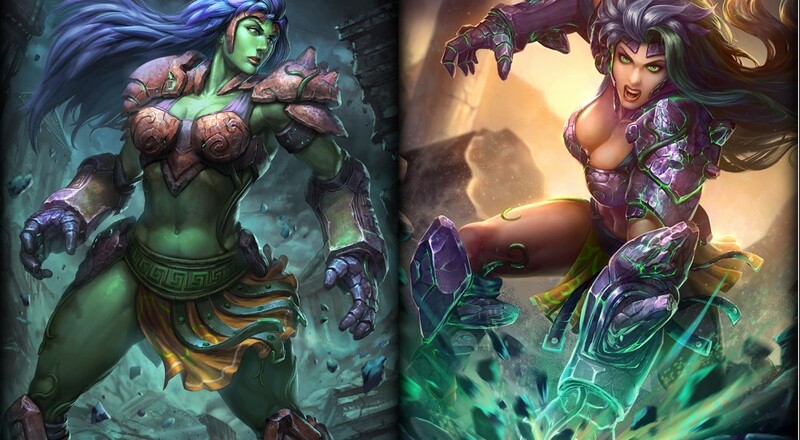 The free-to-play, third-person action MOBA SMITE got a pretty big update today on the PC. In addition to a new goddess, the earth mother Terra, a lot of existing items and gods got some tweaks, too. Terra's falls within the Guardian category of gods, meaning she has low damage, high health, and a fair number of support abilities; those abilities are rather interesting, to be sure. Her main ability, Force of Nature, allows her to charge forward and deal damage to any enemies she hits. However, the primary purpose of this isn't to run at a foe and start attacking them, but to use it in conjunction with her other two abilities: Crushing Earth and Monolith. The former summons two stone slabs opposite one another and can be brought together to crush enemies between them (doing some damage and temporarily stunning them), while the latter summons a singular stone that heals nearby allies. Using her Force of Nature ability to shatter the stones results in new effects. Shattering a Crushing Earth stone sends out a cone of shrapnel that damages enemies in a limited area while shattering a Monolith roots nearby enemies for a brief time and damages them as long as they remain in the area. There's a catch, though. As long as any of these stones are on the battleground, Terra becomes Knockup immune and her basic attacks Slow enemies, so there's a definite degree of strategy involved with when to shatter those stones and when to leave them going. Finally, her ultimate ability, Terra's Blessing, buffs herself and all allies for 10 seconds, increasing their movement speed and cooldowns while simultaneously reducing mana costs. Along with adding Terra, there are a number of changes to the items you buy during a match to further enhance your god, and to the abilities of different gods. Many of those changes are things that undoubtedly change the whole meta game and is way beyond the scope of my time spent playing the Co-Op vs. AI mode, so I recommend checking out the full patch notes for the details. While this patch may apply to PC only today, Hi-Rez has been pretty consistent in getting any updates to the console versions a couple weeks later, so it's likely you can expect to see this on the PlayStation 4 and Xbox One mid to late August.